This article is about the order of chivalry of the Holy See. For the canons regular, see Canons Regular of the Holy Sepulchre. 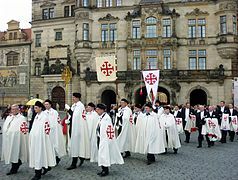 The Equestrian Order of the Holy Sepulchre of Jerusalem (Latin: Ordo Equestris Sancti Sepulcri Hierosolymitani, OESSH), also called Order of the Holy Sepulchre or Knights of the Holy Sepulchre, is a Roman Catholic order of knighthood under the protection of the Holy See. The Pope is sovereign of the Order. Founded as Milites Sancti Sepulcri attached to the Augustinian Canons Regular of the Holy Sepulchre in Jerusalem, recognised in 1113 by Papal bull of Pope Paschal II and of Pope Calistus II in 1122. It traces its roots to circa 1099 under the Frankish Duke Godfrey of Bouillon, Advocatus Sancti Sepulchri, "Defender of the Holy Sepulchre", one of the leaders of the First Crusade and first ruler of the Kingdom of Jerusalem. It is an internationally recognised order of knighthood. Besides the Canons Regular (the Fratres), early members included secular canons (Confratres or Sergentes), Milites Sancti Sepulcri, armed knights of valour and dedication chosen from the crusader troops. Together they vowed to obey the Augustinian Rule of poverty and obedience, and undertook specifically to defend the Holy Sepulchre and the holy places under the command of the King of Jerusalem. Still today, the order bestows Canons as well as Knights, with the primary mission to "support the Christian presence in the Holy Land". With the fall of the Kingdom of Jerusalem by Jerusalem in 1187 and Acre in 1291, the prerogative to adoube Knights of the Holy Sepulchre was transferred to the Franciscan Custody of the Holy Land, the highest Catholic authority in the Holy Land during the Middle Ages. 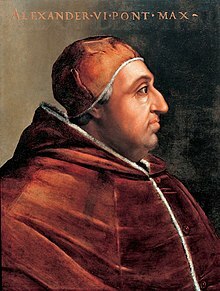 In 1496, Pope Alexander VI vested the Grand Magistry in the Papacy. In 1847, the Latin Patriarchate of Jerusalem was restored by Pope Pius IX and the chivalric order was reorganised based on legal and spiritual ties to the Holy See. From 1949, Grand Masters have been Cardinals. It is the only order of chivalry, together with the Sovereign Military Order of Malta, that is recognised and protected by the Holy See. The order today is estimated to have some 30,000 knights and dames in 60 lieutenancies around the world, including monarchs, heads of state, and their consorts. The Cardinal Grand Master has been Edwin Frederick O'Brien since 2011, and the Latin Patriarch of Jerusalem is Grand Prior. Its headquarters are situated at Palazzo Della Rovere and its official church in Sant'Onofrio al Gianicolo, both in Rome, close to the Vatican City. The Order of the Holy Sepulchre traces its roots to circa 1099 under the Frankish Knight Duke Godfrey of Bouillon (1060–1100), "Advocate of the Holy Sepulchre" (Latin: Advocatus Sancti Sepulchri), leader of the First Crusade and first ruler of the Kingdom of Jerusalem. Fresco by Giacomo Jaquerio in Saluzzo, northern Italy (circa 1420). 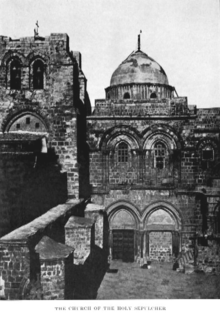 Church of the Holy Sepulchre (1885). Other than some restoration work, its appearance has essentially not changed since 1854. The Immovable Ladder, the small ladder below the top-right window, is also visible in recent photographs; this has remained in the same position since 1854 over a disagreement to move it. The name of the Knights and Order varied over the centuries, including the Milites Sancti Sepulcri and the Sacred and Military Order of the Holy Sepulchre. 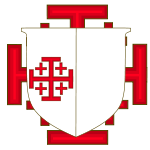 The current name was determined on 27 July 1931 as the Equestrian Order of the Holy Sepulchre of Jerusalem (with of Jerusalem as honorary suffix) by decree of the Sacred Congregation of Ceremonies of the Holy See. 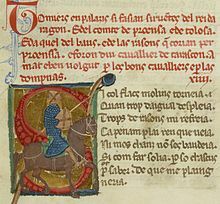 The term Equestrian in this context is consistent with its use for orders of knighthood of the Holy See, referring to the chivalric and knightly nature of order—by sovereign prerogative conferring knighthood on recipients—derived from the Equestrians (Latin: Equites), a social class in Ancient Rome. The history of the Equestrian Order of the Holy Sepulchre of Jerusalem runs common and parallel to that of the religious Canons Regular of the Holy Sepulchre, the order continuing after the Canons Regular of the Holy Sepulchre ceased to exist at the end of the 15th century (except for their female counterpart, the Canonesses Regular of the Holy Sepulchre). Pilgrimages to the Holy Land were a common, if hazardous, practice from shortly after the crucifixion of Jesus to throughout the Middle Ages. Numerous detailed commentaries have survived as evidence of this early Christian devotion. While there were many places the pious visited during their travels, the one most cherished was the Church of the Holy Sepulchre, first constructed by Constantine the Great in the 4th century AD. During the era of the Islamic expansion, Emperor Charlemagne (c. 742–814) sent two embassies to the Caliph of Baghdad, asking Frankish protectorate over the Holy Land. An epic chanson de geste recounts his legendary adventures in the Mediterranean and pilgrimage to Jerusalem. By virtue of its defining characteristic of subinfeudation, in feudalism it was common practice for Knights Commanders to confer knighthoods upon their finest soldiers, who in turn had the right to confer knighthood on others upon attaining command. Tradition maintains that long before the Crusades, a form of knighthood was bestowed upon worthy men at the Church of the Holy Sepulchre. In any case, during the 11th century, prior to the Crusades, "milites sancti Petri" were established to protect Christians and Christian premises in the Occident. Persecution of Christians in the Holy Land intensified. Relations with the world's Christian rulers was further strained when Caliph Al-Hakim bi-Amr Allah ordered the destruction of the Church of the Holy Sepulchre in 1009. The noted Italian historian Francesco Galeani Napione relates the Turco family from Asti, Italy, to the birth of the Order of the Holy Sepulchre, affirming that Gherardo Turco, Signore of Tonco, was among the founders of the order in 1084. The crusades coincided with a renewed concern in Europe for the holy places, with the Church of the Holy Sepulchre as one of the most important places. According to an undocumented tradition, Girolamo Gabrielli of the Italian Gabrielli family, who was the leader of 1000 knights from Gubbio, Umbria, during the First Crusade, was the first crusader to enter the Church of the Holy Sepulchre after Jerusalem was seized in 1099. After the capture of Jerusalem at the end of the First Crusade in 1099, the Canons Regular of the Holy Sepulchre were established to take care of the church. The men in charge of securing its defense and its community of canons were called Milites Sancti Sepulcri. Together, the canons and the milites formed part of the structure of which evolved into the modern Equestrian Order of the Holy Sepulchre of Jerusalem. Baldwin I, the first Latin King of Jerusalem, laid the foundations of the kingdom and established its main institutions on the Norman-French pattern as a centralised feudal state. He also drew up the first constitution of the order in 1103, modeled on the chapter of canons that he founded in Antwerp prior to his departure, under which the Latin Patriarch of Jerusalem (who had supplanted the Greek Orthodox Patriarch) appointed knights in Jerusalem at the direct service of the crown, similar to the organisation of third orders. Adopting the rule of Saint Augustine, with recognition in 1113 by Papal Bull of Pope Paschal II, with the Milites Sancti Sepulcri attached, it is considered among the oldest of the chivalric orders. Indications suggest that Hugues de Payens (c. 1070–1136) was among the "Milites Santi Sepulcri" during his second time in Jerusalem in 1114–16, before being appointed "Magister Militum Templi", establishing the Knights Templar. Between c. 1119–c. 1125, Gerard (Latin: Girardus), the Prior of the Holy Sepulchre, along with Warmund, Patriarch of Jerusalem, wrote an important letter to Diego Gelmírez, Archbiship of Santiago de Compostela citing crop failures and being threatened by their enemies; they requested food, money, and military aid in order to maintain the Kingdom of Jerusalem. Gerard consequently participated among others in the Council of Nablus, 16 January 1120. In it, Canons 20–21 deal with clerics. Canon 20 says a cleric should not be held guilty if he takes up arms in self-defense, but he cannot take up arms for any other reason nor can he act like a knight. This was an important concern for the crusader states; clerics were generally forbidden from participating in warfare in European law, but the Crusaders needed all the manpower they could find, and only one year before, Antioch had been defended by the Latin Patriarch of Antioch following the Battle of Ager Sanguinis, one of the calamities referred to in the introduction to the canons. Canon 21 says that a monk or canon regular who apostatizes should either return to his order or go into exile. In 1122, Pope Callistus II issued a bulla establishing a lay religious community with specific responsibilities to defend the Church Universal, protect the City of Jerusalem, guard the Basilica of the Holy Sepulchre and pilgrims, and fight in the defence of Christianity. 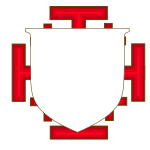 In total, as a result of these military needs, five major chivalric orders were formed in the Kingdom of Jerusalem between the late 11th century and the early 12th century: the Knights Hospitaller (Order of Saint John) (circa 1099), the Knights of the Holy Sepulchre (circa 1099), the Knights Templar (circa 1118), the Knights of Saint Lazarus (1123), and the Knights of the Hospital of Saint Mary of Jerusalem (Teutonic Knights) (1190). but both the Order of Malta and the Order of the Holy Sepulchre continue as chivalric orders recognised by the Holy See. The Pactum Warmundi, establishing 1123 an alliance of the Kingdom of Jerusalem with the Republic of Venice, was later signed by Patriarch Warmund and Gerard, Prior of the Holy Sepulchre, along with Ehremar, Archbishop of Caesarea; Bernard, Bishop of Nazareth; Aschetinus, Bishop of Bethlehem; Roger, Bishop of Lydda; Guildin, Abbot of St. Mary of Josaphat; and Aicard, Prior of the Templum Domini; Arnold, Prior of Mount Sion; William Buris; and the Chancellor, Pagan. Aside from William and Pagan, no secular authorities witnessed the treaty, perhaps indicating that the allied Venetians considered Jerusalem a Papal fief. Meanwhile, beyond the Holy Land, in Spain, during the Reconquista, military orders built their own monasteries which also served as a fortresses of defense, though otherwise the houses followed monastic premises. A typical example of this type of monastery is the Calatrava la Nueva, headquarters of the Order of Calatrava, founded by the Abbot of Fitero, Raymond, at the behest of King Sancho III of Castile, to protect the area restored to the Islamic rulers. 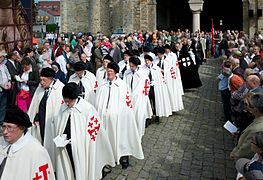 Other orders as, such as the Order of Santiago, Knight Templars and the Holy Sepulchre devoted much of their efforts to protect and care for pilgrims on the Camino de Santiago. Furthermore, at the Siege of Bayonne in October 1131, three years before his death, King Alfonso I of Aragon, having no direct heir, bequeathed a will leaving his kingdom to three autonomous religious orders based in the Holy Land and politically largely independent—the Knights Templars, the Knights Hospitallers and the Knights of the Holy Sepulchre—whose influences might have been expected to cancel one another out. The will has greatly puzzled historians, who have read it as a bizarre gesture of extreme piety uncharacteristic of Alfonso's character, one that effectively undid his life's work. Elena Lourie (1975) suggested instead that it was Alfonso's attempt to neutralize the papacy's interest in a disputed succession—Aragon had been a fief of the Papacy since 1068—and to fend off Urraca's son from her first marriage, Alfonso VII of Castile, for the Papacy would be bound to press the terms of such a pious testament. In 15 July 1149 in the Holy Land, the Church of the Holy Sepulchre in Jerusalem was consecrated after reconstruction. Crusade vows meant that even if a person wasn't able to make the journey to Holy Sepulchre himself, sometimes his cloak was taken there, as was the case with King Henry the Young of England (1155–1183). Robert the Bruce and James Douglas, Lord of Douglas even asked to have their hearts taken to the Holy Sepulchre after death. I will that as soone as I am trespassed out of this worlde that ye take my harte owte of my body, and embawme it, and take of my treasoure as ye shall thynke sufficient for that enterprise, both for your selfe and suche company as ye wyll take with you, and present my hart to the holy Sepulchre where as our Lorde laye, seyng my body can nat come there. Besides pilgrimages and the creation of knights, even coronations took place at the Holy Sepulchre. Shortly before his death in 1185, Baldwin IV ordered a formal crown-wearing by his nephew at the Church of the Holy Sepulchre. It was Baldwin IV himself — a tall man — who carried the child Baldwin V on his shoulder at the ceremony, signifying the support of Isabella's family for her nephew. Soon after, the eight-year-old boy became sole king. 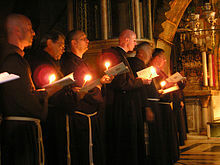 The official arrival of the Franciscan Friars Minor in Syria dates from the papal bull addressed by Pope Gregory IX to the clergy of the Holy Land in 1230, charging them to welcome the Friars Minor, and to allow them to preach to the faithful and hold oratories and cemeteries of their own. In the ten years' truce of 1229 concluded between Frederick II of Sicily and the Sultan Al-Kamil, the Franciscans were permitted to enter Jerusalem, but they were also the first victims of the violent invasion of the Khwarezmians in 1244. The ultimate fall of the Kingdom of Jerusalem to the Muslims in 1291 did not suspend pilgrimages to the tomb of Christ or the custom of receiving knighthood there, and when the Custody of the Holy Land was entrusted to the Franciscan Order, they continued this pious custom and gave the order its first Grand Master after the death of the last King of Jerusalem. The friars quickly resumed possession of their convent of Mount Sion at Jerusalem. The Turks tolerated the veneration paid to the tomb of Christ and derived revenue from the taxes levied upon pilgrims. In 1342, in his Bull Gratiam agimus, Pope Clement VI officially committed the care of the Holy Land to the Franciscans; only the restoration of a Latin Patriarchate of Jerusalem by Pius IX in 1847 superseded the Franciscans. With the emergance of the code of conduct of chivalry during the Middle Ages, conferring of knighthoods pursued also at the Holy Sepulchre. From the period 1291 to 1847, the Franciscan Custodian of Mount Sion was the only authority representing the Holy See in the Holy Land. Documentated from 1335, the Franciscan Custody was enrolling applicants among the lay order of the Knights of the Holy Sepulchre in ceremonies frequently mentioned in the itineraries of pilgrims. Those pilgrims deemed worthy of the honour were received into the order with a solemn ceremony of ancient chivalry. However, in the ceremonial of reception, at the time, the role of the clergy was limited to the benedictio militis, the dubbing with the sword being reserved to a professional knight, since the carrying of the sword was incompatible with the sacerdotal character, reserved to previous knights. Post misam feci duos milites nobiles supra selpulchram gladios accingendo et alia observando, quae in professione militaris ordinis fieri consueverunt. After mass, I made two [of my companions] noble knights of the Sepulchre by encircling swords and others observing, who were proudly inured into the profession of military order. 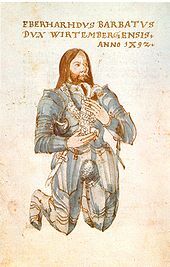 Eberhard I, Duke of Württemberg (1492). The Duke chose a palm as his personal symbol in commemoration of his pilgrimage to Jerusalem in 1468 when he became a Knight of the Holy Sepulchre. In 1346, King Valdemar IV of Denmark went on a pilgrimage to Jerusalem and was made a Knight of the Holy Sepulchre — an act that increased the prestige of this King, who had difficulty in effectively ruling over his kingdom. Saint Bridget of Sweden, one of the future Patron saints of Europe, made a pilgrimage to the Holy Land in 1371–1373 along with her sons. The oldest, Karl, died prior in Naples, but Birger Ulfsson became a Knight of the Holy Sepulchre, followed by Hugo von Montfort (1395), and more to come. Albert IV, Duke of Austria was dubbed to Knight in 1400, followed by his brother Ernest, Duke of Austria (1414), followed by King Eric of Pomerania, ruler of the Kalmar Union (1420's) and later Frederick III, Holy Roman Emperor (1436), accompanied by Georg von Ehingen and numerous other nobles knighted, earning him great reputation, whereafter Otto II, Count Palatine of Mosbach-Neumarkt (1460), William III, Landgrave of Thuringia (1461) and Heinrich Reuß von Plauen (1461). The latter was also Grand Master of the Teutonic Order. The significance of the pilgrimages are indicated by various commemorations of the knights. The Church of the Holy Sepulchre of Görlitz in Saxony was built by Georg Emmerich, who was knighted in 1465. Of the medieval Knights of the Holy Sepulchre, notably, Emmerich, although a mayor and a wealthy merchant, was neither a monarch, nor of the nobility. Eberhard I, Duke of Württemberg, knighted together with Christoph I, Margrave of Baden-Baden in 1468, chose a palm as his personal symbol, including in the crest (heraldry) of his coat of arms. Others built church buildings in their hometowns, such as the chapel in Pratteln, Switzerland, by Hans Bernhard von Eptingen (knighted 1460), and Jeruzalemkerk in Bruges, Belgium, built by Anselm Adornes (knighted 1470). The latter still stands to this day, modelled on the Church of the Holy Sepulchre and today adorned with the heraldry of the order. From 1480 to 1495, John of Prussia, a German Knight of the Holy Sepulchre, acted as steward for the convent and regularly discharged this act reserved to knighthood. It was also of frequent occurrence that a foreign Knight present among the crowds of pilgrims would assist at this ceremony. However, in default of other assistance, it was the superior who had to act instead of a Knight, although such a course was deemed irregular. It was since then also that the superior of the convent assumed the title of Grand Master, a title which has been acknowledged by various pontifical diplomas, and finally by a Papal Bull in 1746 by Pope Benedict XIV. Despite an attempt in 1489 by Pope Innocent VIII to a merge with the Knights Hospitaller, along with other suppressed organisations, the Knights of the Holy Sepulchre persisted. While some of the property of the order in Italy was transferred to the newly established Order of Our Lady of Bethlehem, the attempt, however, proved a failure. The Order of Our Lady of Bethlehem was suppressed almost as soon as it was founded and those orders whose goods the Pope had transmitted to it were re-established. The accolades continued: Enno I, Count of East Frisia and Edzard I, Count of East Frisia (1489), followed by Frederick III, Elector of Saxony (1493), who was also recipient of the Papal honour of the Golden Rose, together with Christoph the Strong, Duke of Bavaria, followed by Frederick II of Legnica (1507), and others. The Franciscan province of the Holy Land continued to exist, with Acre as its seat. In the territory of the Latin Patriarchate of Jerusalem, reinstituted in 1847, the Franciscans still have 24 convents, and 15 parishes. 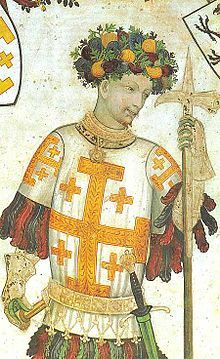 Pope Alexander VI restored the Order of Holy Sepulchre to independent status in 1496, and reserved its title of Grand Master for himself and his successors. In 1496, Pope Alexander VI restored the Knights of the Holy Sepulchre to independent status. He decreed that the order would no longer be governed by the Custody of the Holy Land, but that the senior post of the order would henceforth be raised to the rank of Grand Master, reserving this title for himself and his successors. The prerogative of dubbing Knights of the Holy Sepulchre was repeatedly confirmed by the Holy See; by Pope Leo X on 4 May 1515, by Pope Clement VII in 1527 and by Pope Pius IV on 1 August 1561. Pope Leo X with his Cardinal-cousin Giulio de' Medici (left), future Pope Clement VII, in painting by Raphael (1519). Both endorsed the dubbing of knights. In France, King Henry IV of France purchased its French possessions and incorporated them into his newly established Order of Our Lady of Mount Carmel, formally established by Pope Paul V through the Bull Romanus Pontificus 16 February 1608 and expanded through Militantium ordinum, dated 26 February 1608, along with possessions of other orders which apparently were all deemed extinct and abolished, indicating declined regional activity. Nonetheless, the dubbing and the privileges enjoyed continued confirmation by Pope Alexander VII on 3 August 1665, by Pope Benedict XIII on 3 March 1727, and by Pope Benedict XIV (1675–1758), who approved all but the last of the privileges of the order, and also stated that it should enjoy precedence over all orders except the Order of the Golden Fleece. Knights of the Holy Sepulchre dubbed during this era include Hieronymus von Dorne (circa 1634) and François-René de Chateaubriand (1806). Count Christopher de Paus (1862–1943), Knight Commander with Star of the Order of the Holy Sepulchre. Pius IX re-established the Latin Patriarchate of Jerusalem in 1847, and re-organized the Order of the Holy Sepulchre as the Milites Sancti Sepulcri, whereby the Grand Master of the order was to be the Latin Patriarch of Jerusalem, and the order ceased to be a Pontifical order for a period. 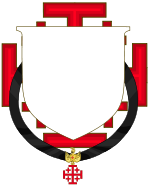 Initially, the Sovereign Military Order of Malta opposed the decision, claiming rights to its legacy probably based on the papal decision of 1489. However, in 1868 it was named Equestris Ordo Sancti Sepulcri Hierosolymitani (English: Equestrian Order of the Holy Sepulchre of Jerusalem). Pope Pius X assumed the title of Grand Master again for the papacy in 1907, but in 1928 this was again relinquished by Pope Pius XI in favour of the Patriarch of Jerusalem, and for a time the order again ceased to be a papal order. 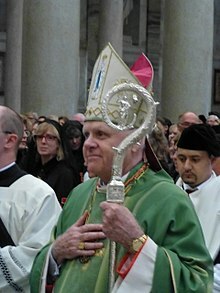 Cardinal Edwin Frederick O'Brien, Grand Master of the Order of the Holy Sepulchre since 2011, during a pilgrimage in Rome (2013). The Palazzo Della Rovere, the order's international headquarters where its Grand Magisterium is situated. 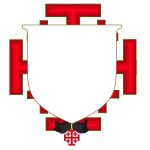 The order is today primarily honorific, a public association of the faithful with a legal canonical and public personality, constituted by the Holy See under Canon Law 312, paragraph 1:1, represented by 60 lieutenancies in more than 40 countries around the world: 24 in Europe, 15 in the United States and Canada, 5 in Latin America and 6 in Australia and Asia. It is recognised internationally as a legitimate order of knighthood, headquartered in Vatican City State under papal sovereignty and having the protection of the Holy See. Its principal mission is to reinforce the practice of Christian life by its members in absolute fidelity to the Pope; to sustain and assist the religious, spiritual, charitable and social works and rights of the Catholic Church and the Christians in the Holy Land, particularly of the Latin Patriarchate of Jerusalem, which annually receives some 10 million dollars by the donations of the members of the order. Other various activities around the world are connected to their original functions. Regional activities include participation in local processions and religious ceremonies, such as during Holy Week. In France, the French Revolution resulted in a ban on conserving relics and all other sacred symbols linked to the Kings, though this allowed for pieces judged to be of high artistic quality to be saved. These relics were handed over to the Archbishop of Paris in 1804 and are still held in the cathedral treasury of Notre Dame de Paris, cared for by the Knights of the Holy Sepulchre and the cathedral chapter. On the first Friday of every month at 3:00 pm, guarded by the Knights, the Relics of Sainte-Chapelle are exposed for veneration and adoration by the faithful before the cathedral's high altar. Every Good Friday, this adoration lasts all day, punctuated by the liturgical offices. An exhibition entitled Le trésor de la Sainte-Chapelle was put on at the Louvre in 2001. The order was a significant donor in the restoration of the Statue of St. John of Nepomuk in Divina, Slovakia, in 2017. In 1496, Pope Alexander VI vested the office of Grand Master in the Papacy where it remained until 1949. From 1949, Cardinal Grand Masters have held the office. The incumbent Cardinal Grand Master is Edwin O'Brien since 2011. The offices of the grand magisterium are situated in the headquarters in Rome. Its headquarters is situated at Palazzo Della Rovere in Rome, the 15th-century palace of Pope Julius II, immediately adjacent to the Vatican on the Via della Conciliazione. It was given to the order by Pope Pius XII. Its official church is Sant'Onofrio al Gianicolo, also in Rome, and also given to the order by Pius XII. In 1307, after the suppression of the Knights Templars, the Canons Regular of the Holy Sepulchre, whose main priory was at San Luca, acquired the complex of San Manno. Francesco della Rovere, the future Pope Sixtus IV, was Arch-Prior there 1460–1471. Coat of arms of the Kingdom of Jerusalem. 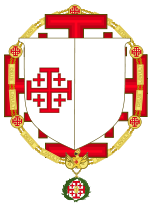 By ancient tradition,[year needed] the order uses the arms attributed to the Kingdom of Jerusalem—a gold Jerusalem Cross on a silver/white background—but enamelled with red, the colour of blood, to signify the five wounds of Christ. Use of the symbol is in the 1573 Constitution of the Order. Conrad Grünenberg already shows a red Jerusalem cross (with the central cross as cross crosslet rather than cross potent) as emblem of the Order in his 1486 travelogue. 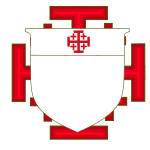 Above the shield of the Armorial Bearings is a sovereign's gold helmet upon which are a crown of thorns and a terrestrial globe surmounted by a cross, flanked by two white standards bearing a red Jerusalem Cross. The supporters are two angels wearing dalmatic tunics of red, the one on the dexter bearing a Crusader flag, and the one on the sinister bearing a pilgrim's staff and shell: representing the military/crusading and pilgrim natures of the order. The motto is "Deus lo Vult" (translation: "God Wills It"). The seal of the order is in the shape of an almond and portrays, within a frame of a crown of thorns, a representation of Christ Rising from the Sepulchre. 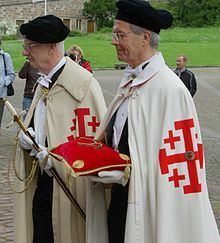 The Order of the Holy Sepulchre and the Sovereign Military Order of Malta are the only two institutions whose insignia may be displayed in a clerical coat of arms. The arms are quartered with those of the order. Members and regalia during a ceremony of investiture in Fulda, Germany, in 2009. The order has a predominantly white-coloured levée dress court uniform, and a more modern, military-style uniform, both of which are now only occasionally used in some jurisdictions. Pope Pius X ordained that usual modern choir (i.e. church) dress of knights be the order's cape or mantle: a "white cloak with the cross of Jerusalem in red", as worn by the original knights. Female members wear a black cape with a red Jerusalem cross bordered with gold. The choir vestments of Canons of the Holy Sepulchre include a black cassock with magenta piping, magenta fascia, and a white mozetta with the red Jerusalem cross. 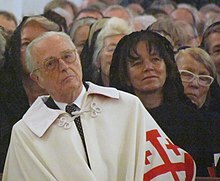 Franz, Duke of Bavaria, overseeing an investiture among male and female members of the Order of the Holy Sepulchre in Munich, Bavaria, Germany. The order today is estimated to have some 30,000 knights and dames in 60 Lieutenancies around the world, including Monarchs, Crown Princes and their consorts and Heads of State from countries such as Spain, Belgium, Monaco, Luxembourg and Liechtenstein. Membership of the order is by invitation only, to practicing Catholic men and women—laity and clergy—of good character, minimum 25 years of age, who have distinguished themselves for concern of the Christians of the Holy Land. Aspirant members must be recommended by their local bishop with the support of several members of the order, and are required to make a generous donation as a "passage fee", echoing the ancient practice of crusaders paying their passage to the Holy Land, as well as an annual financial offering for works undertaken in the Holy Land, particularly in the Latin Patriarchate of Jerusalem, throughout their life. There is a provision for the Grand Master to admit members by motu proprio in exceptional circumstances and also for the officers of the Grand Magistery to occasionally recommend candidates to the Grand Master. The honour of knighthood and any subsequent promotions are conferred by the Holy See — through diploma sealed and signed by the Assessor for General Affairs of the Secretariat of State in Rome as well as the Cardinal Grand Master — which approves each person, in the name of and by the authority of the Pope. The candidate is subsequently knighted or promoted in a solemn ceremony with a Cardinal or major prelate presiding. Knights and Dames of the order may not join, or attend the events of, any other order that is not recognised by the Holy See or by a sovereign state, and must renounce any membership in such organisations before being appointed a Knight of the Holy Sepulchre. Knights and Dames may be expelled from the order in circumstances where they breach its rules of conduct. There are several grades of knighthood. These are open to both men and women. While laity may be promoted to any rank, the ranks of the clergy are usually as follows: Cardinals are generally Knights Grand Cross, Bishops are Commanders with Star, and priests and deacons start with the rank of Knight but may be promoted to Commander. Female members may wear chest ribbons rather than neck crosses, and the military trophies in insignia and heraldic additaments are replaced by bows. 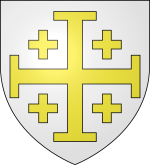 NB in the above depictions, the cross behind the shield should only be borne by Archbishops, Bishops, Prelates and those with a title of nobility. In English, a female member of this Order has sometimes been titled "Lady" in reaction to slang use of the term "dame" to refer to any woman. However, in accordance with standard chivalric practice in English, female members are now called "Dame" (from the Latin title Domina, Italian Dama, etc.) and this is the usual practice in most Lieutenancies: "Dame" is the usual English title of a female member of an order of chivalry; a "Lady" in terms of orders of chivalry is usually the wife of a member although there are exceptions: for example female members of the British Order of the Garter may be called either "Lady (Royal and/or Supernumerary) Companion" (but not simply "Lady") or "Knight (Royal and/or Supernumerary) Companion". There is no provision in the constitution to use other titles in English, such as "Sir", for knights although this is occasionally used. In some English-speaking Lieutenancies, and consistent with the constitution and diplomatic practice of using French, a Knight is addressed as Chevalier, abbreviated Chev.. The Diploma of Investiture of the Order, written in Latin, uses the term "Equitem" ("Knight") and the corresponding certificate for the Pilgrim Shell uses the Latin title "Dominum" ("Sir"). In accordance with the origins of the Order, and considered more consistent with ordained ministry than the military title of Knight, invested clergy are ipso facto Titular Canons of the Order of the Holy Sepulchre (however, the late Grand Master John Cardinal Foley argued that this would be better applied to clergy with the rank of Commander). Additionally, deacons, priests and bishops may also receive the distinguished honorary title of Canon of the Holy Sepulchre personally by the Latin Patriarch of Jerusalem. Both Titular Canons of the Holy Sepulchre (EOHSJ) and Honorary Canons of the Holy Sepulchre of the Latin Patriarchate of Jerusalem are entitled to identical insignia, i.e. white mozetta with red Jerusalem cross and choir dress including the black cassock with magenta piping and magenta fascia. The remains of Blessed Bartolo Longo (1841–1926), "Confessor", "Apostle of the Rosary" and member of the Order of the Holy Sepulchre, inside the Shrine of the Virgin of the Rosary of Pompei in Italy. Reserved to members, the Palm of Jerusalem is the decoration of distinction, in three classes. Additionally, Knights and Ladies making a pilgrimage to the Holy Land receive the Pilgrim Shell, a reference to the shells used as a cup by the pilgrims in the Middle Ages. Both of these are generally awarded by the Grand Prior of the order, the Latin Patriarch of Jerusalem. 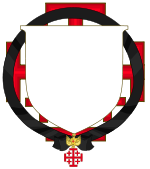 The Cross of Merit of the Order may also be conferred on meritorious non-members of the order, for example non-Catholics. Entrance of the Church of the Holy Sepulchre. 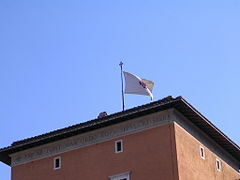 Flag of the Order of the Holy Sepulchre over the Palazzo della Rovere. The convent of Sant'Onofrio al Gianicolo contains the official church of the order. The Arab-Norman Chiesa di San Cataldo, local church to the order in Palermo, Sicily, since 1937. Notre Dame de Paris in France, where the Relics of Sainte-Chapelle are exposed by the Knights of the Holy Sepulchre. Investiture in Dresden, Germany, in 2010. Inside Dresden Cathedral, 9 October 2010. Pope Pius XII seated in the Sedia Gestatoria in 1939. An 1846 picture of Pope Pius IX soon after his election to the papacy. ^ "Equestrian Order of the Holy Sepulchre of Jerusalem – Index, History". Retrieved 4 January 2009. 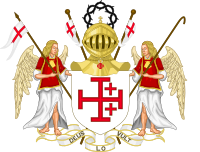 ^ a b c d e "History - Equestrian Order of the Holy Sepulchre of Jerusalem". ^ a b c "Homepage of the Grand Maigisterium. About us". Order of the Holy Sepulchre. Retrieved 19 May 2017. ^ a b c d "Official website page 1". Order of the Holy Sepulchre. Archived from the original on 2 April 2015. ^ "History of the order form the Western Australia Lieutenancy website". ^ Pope Innocent II indeed did write Alfonso VII to just this effect, 10 June 1135 or 36 (Lourie 1995:645). ^ Allgemeine encyclopädie der wissenschaften und künste in alphabetischer folge von genannten schrifts bearbeitet und herausgegeben von J. S. Ersch und J. G. Gruber, J. f. Gleditsch, 1828, S. 158 f.
^ "CATHOLIC ENCYCLOPEDIA: Order of Friars Minor". ^ "Official website of the Order of the Holy Sepulchre". Archived from the original on 2 April 2015. ^ H. Schulze: Chronik sämmtlicher bekannten Ritter-Orden und Ehrenzeichen, welche von Souverainen und Regierungen verliehen werden, nebst Abb. der Decorationen. Moeser 1855, S. 566 f.
^ "Accueil - Notre Dame de Paris". ^ Sobola, Marek (2017). Príbeh svätojánsky, Socha sv. Jána Nepomuckého v Divine / The Story of St. John, Statue of St. John of Nepomuk in Divina / ដំណើររឿងរបស់ St. John, រូបចម្លាក់ St. John Nepomuk នៅក្រុង Divina / Die Johannisgeschichte, Die Staute des hl. Johannes Nepomuk in Divina / Историята на св. Ян, Статуята на св. Ян Непомуцки в Дивина. Slovakia: Servare et Manere, o. z. & Kysucké múzeum v Čadci. pp. 77–79. ISBN 978-80-972614-3-6. ^ www.tkkbs.sk. "Biskup Galis požehnal obnovenú sochu sv. Jána Nepomuckého v Divine". www.tkkbs.sk. Retrieved 29 July 2017. ^ "Collar bestowed on Vice Governor Generals and Lieutenant General". www.oessh.va. Retrieved 17 May 2017. ^ "The Grand Magisterium's 2016 Autumn Meeting". www.oessh.va. Retrieved 17 May 2017. ^ "Il Gran Magistero dell'Ordine Equestre del Santo Sepolcro di Gerusalemme". ^ "Key to Umbria: Perugia". ^ "EOHSJ — Ceremonial Dress". ^ "Almanach de la Cour". ^ "Congregazione per l'Educazione Cattolica". ^ "Members of the Order". EOHSJ Toronto. Retrieved 18 April 2019. ^ Canon 1898, Ordo S. Sepulchre, Romae,1894. 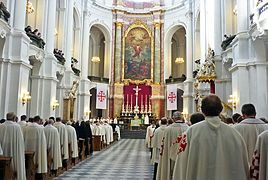 ^ "New honorary Canon of the Holy Sepulchre in Brescia". 13 September 2012. Blasco, Alfred J. (1998). The Modern Crusaders. PenRose. ISBN 0-9632687-7-5. Noonan, Jr., James Charles (1996). The Church Visible: The Ceremonial Life and Protocol of the Roman Catholic Church. Viking. p. 196. ISBN 0-670-86745-4. Noonan, Jr., James-Charles (2012). The Church Visible: The Ceremonial Life and Protocol of the Roman Catholic Church Revised Edition. Sterling-Ethos. p. 139. ISBN 978-1-4027-8730-0. Sainty, G. 2006. Order of the Holy Sepulchre. World Orders of Knighthood & Merit. Guy Stair Sainty (editor) and Rafal Heydel-Mankoo (deputy editor). United Kingdom: Burke's Peerage & Gentry. 2 Vol. (2100 pp). Wikimedia Commons has media related to Order of the Holy Sepulchre.